The algorithm-based feature has human oversight...for now. As Facebook fights its own fake news problem, Twitter looks like it's interested in finding more ways to push news content to its microblogging service. According to a report at BuzzFeed, Twitter has confirmed that it is testing new algorithm-curated timelines when big events happen, then putting tweets from news organizations and other users at the top of your timeline. So far, Twitter says humans are involved in story selection, but a Twitter spokesperson told BuzzFeed that it could be come only algorithmic in the future. This morning, I woke to find the news of Stephen Hawking's passing at the top of the Twitter feed on my iPhone, but thought nothing of it; it felt like a natural Twitter feature. Buzzfeed notes that other top news today (the congressional special election in Pensylvania and a lawsuit filed against Fox News) also topped many users' feeds. "People come to Twitter to see and talk about what's happening," Twitter's Keith Coleman told the site in a statement. "We're working on ways to make it easier for everyone to find relevant news and the surrounding conversation so they can stay informed about what matters to them." 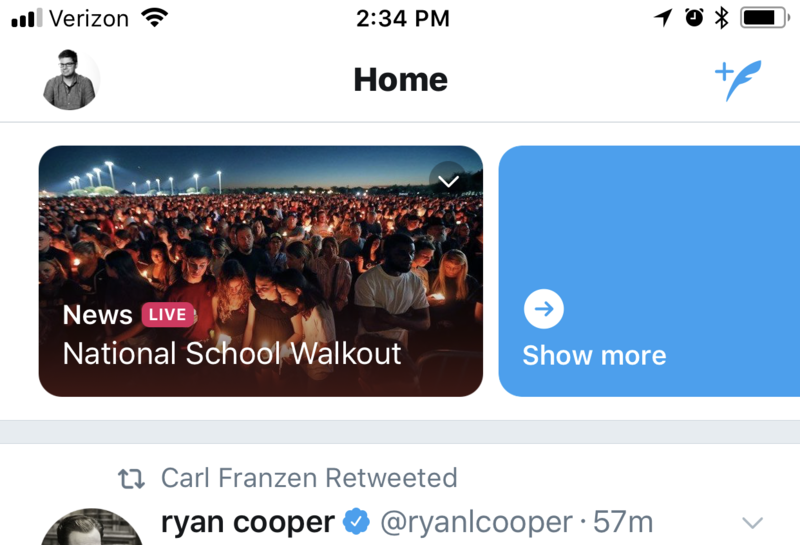 This new feature seems likely to be related to Twitter's Happening Now feature, which groups tweets about ongoing events together, though it's typically been used for sports news. Twitter tried out dedicated news tab in 2015, too, though it didn't last. The new feature sits atop your regular Twitter feed, so may feel more natural to regular users.